And it’s little I care where my wings should go! Between the migrations (both coming and going) and all of the up-from-under-the-dirt action, it’s no wonder we get a bit restless, too. Now, if we just can get the pollen to fly away, we’ll be all set. I heard that today’s pollen count was the highest in some time. This, from the good folks at UTMB: “For the last 4 years, the highest pollen counts ranged from 2062 to 2669 grains per cubic meter. This year, the oak pollen counts topped 6,000 grains per cubic meter.” With so many flowers, so soon, I suppose we should have expected it. It’s good of you to have caught the bird in flight; good also to have anchored it to the earth with a fringe of greenery across the bottom of the image. I thought so, too. A few times there’s been no way to capture the birds with anything but sky in the background, as with the great white egrets’ courtship displays. But just as a full moon looks better with some clouds, or a tree limb, or a mountain, I think the birds look better wtih a bit of complementary detail. Thank you, Rethy. I do love the ibis: they’re funny, quite engaging to watch, and unexpectedly graceful when they fly. It’s a great shot and I like your pastiche poem, gosh that bird is arching its wings for all it’s worth – it may not care why or where it’s going, but it’ll get there in good time. When I looked up Millay, because I don’t know anything about her, I saw she lived in Austerlitz, NY, the town named in response to the naming of my town, for Waterloo. They are fast flyers, and they’ll often fly in great V’s, like geese. On the other hand, they like to walk, too, and often can be found just trucking down the road, for all the world like a bunch of pals out for a stroll. I did a little extra raeding myself, and found that the Austerlitz place was called Steepletop, for the plant called steeplebush that grows there. It’s a beautiful plant — it must have been something to see. I saw more ibis statuettes in a little museum in Albany recently, in a display of Egyptian mummies, etc., they must have been one of their favorite birds. I grew up with a quite different spirea that was white; it was called bridal wreath. I knew the ibis was sacred in Egypt, but couldn’t remember why. I found this on the BBC “History of the World” site: “The Ibis was sacred to and associated with Thoth, the God of wisdom and writing. Thoth was often represented in the form of a man’s body with the head of the Ibis and was the patron of the educated scribes who were responsible for the administration of Egypt.” How about that? As a former journalist, I can relate to this one! I think I must have a touch of gypsy in my soul for ’tis so hard to be earthbound when part of me needs to SOAR!!! It’s clear that some of the birds enjoy flight for its own sake, just as they’ll sing for the pure pleasure of it. Mockingbirds turn somersaults in the air, and seagulls will spiral so high into the sky they hardly can be seen. It’s spring fever, Debbie — I think they’re as eager to enjoy the season as we are. Can’t you just hear them saying to one another, “No more huddling in the reeds, freezing our feet off.” Here’s to a little spring soaring! I always love seeing these birds flying over my yard, a rare occurrence to be sure. Only once have I actually had a group in my yard. That’s really interesting, because I’ll see groups around here from time to time. They’re not always large (a half-dozen is usual) but I’ve seen as many as two dozen or more making their way across lawns and large grassy areas, plucking who-knows-what out of the ground. They’ll eat grasshoppers, mole crickets, and crawfish, and we have plenty of those. Maybe your lawn is too healthy for them to be able to find tidbits! It’s a beautiful image of a fabulous bird. How is it at your house? When I read these words: “But away from this pond, lest my heart break, I must go, and off somewhere,” my heart breaks a little for you. Things are fine here, Jeanie. When I choose this bit of verse to go with the image (or vice-versa — sometimes I’m not sure which comes first) I really was thinking of the serious case of wanderlust that always comes over me in spring. It feels like it’s time to start traveling — just like the birds do. I’m going to pick up Dixie’s ashes tomorrow. I don’t have any specific plans for them, so for the time being, I’ll tuck them around here somewhere. I have finally figured out why it seems so quiet, and it’s the most obvious explanation in the world. We talked to each other a good bit. Granted, I wasn’t always eager for a chat at 3 in the morning, but when she wanted to talk, she could be persistent. It’s a mixed blessing, but a blessing nonetheless that I can get a full night’s sleep now. No need to do anything with them, unless you decide you want to. Gypsy “sits” in his wee tin (there wasn’t much left of him) on the window sill behind a curtain — he loved looking out the window and now he’s there. Now and then I pull back the curtain or hold the tin, then back it goes. Maybe one day he (and Stimpy and Lizzie) will “go with me” wherever that ends up being. I just hope Rick doesn’t put the tin in an estate sale thinking it’s one more piece of Jeanie junk! We should talk about that one, he and I. Should your wanderlust take you to Michigan, I know someone who lives here who would be delighted to see you! A couple of people, actually! Well, my wanderlust got me to the Texas hill country, anyway. It was — is — good to get out and about a bit. I’ve got Dixie back now. I picked her up before leaving town, and laughed a good bit at the thought that it’s the first time she’s gone with me to the hill country. I was surprised to get a paw print, too. It’s on a pretty, round terra cotta plaque with her name inscribed. I left that at home, lest it get broken somehow. It was a nice addition to the memorabilia. As for Michigan? Who knows? I’ve certainly thought about it enough! My dad used to say answers to the question “Why?” usually boil down to one of these: “Why not?” or “Because.” There’s some truth to that. I’ll bet you do, Terry — especially at the end of a long winter! Glad you like the photo. I love ibis, and really enjoy watching both of our common species mature. I’m still not wholly confident of my ability to distinguish between the glossy and the white-faced, but once I’m sure of that ID, I’ll show some of them. If I look at that photo and read that poem each morning. How could the day fail to be wonderful? The verses do have a bit of a lilt to them, don’t they? I can almost imagine the ibis flapping its wings in time with their rhythm, although I expect we’d have to recite pretty quickly to keep up with him. Speaking of wonderful, I was glad to read the news out of Austin this morning. It has to have been an unnerving three weeks. I hope there aren’t other devices still to be discovered. I love the highly detailed Ibis and the poem by Edna St. Vincent Millay. I see that Florida has the white ibis, too, as well as the much less common glossy ibis. What I’ve assumed to be glossy ibis here apparently are the white-faced ibis, but I’m going to have to spend a little more time watching and photographing them. They’ll be easier to identify in breeding plumage. I enjoy Millay’s full poem as much as this snippet that I had some fun with. It’s little “hook” at the end was particularly delightful. I have been on more flights this year than I usually do in years. 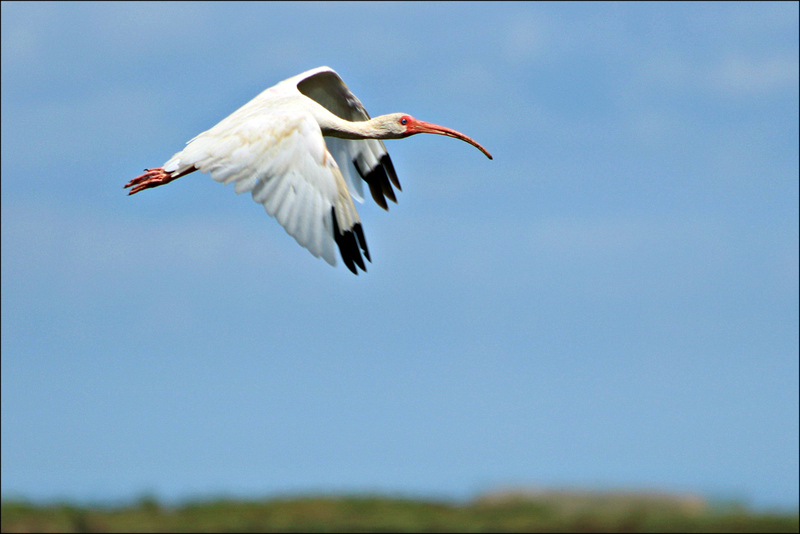 None of the flights made me feel or look as graceful as the ibis. I saw ibis on the ground in Cairns. The graceful fliers were the bats on their evening sorties. I am so sorry to hear about Dixie Rose. I can well imagine you’re ready to stay on terra firma for at least a little while. It’s lovely to see you. I’ve been thinking of you, and hoping that things were going well. I looked at your white ibis: interesting that they have black bills and legs, but no black patches at the end of their wings. Their black heads remind me just a bit of our black vultures. At first glance, they seem featureless, but a closer look reveals some nice detail. It was quite a shock to lose Dixie. I’d expected a long, slow decline with increasing need for medications or other care, not a two-hour blur of discovery and loss. Given the nature of the embolism she suffered (whatever its cause) there was no question about the right course, and I certainly am glad I found her in time to prevent extended suffering. I certainly do miss her. Eighteen years is a long time. 18 years is a very long relationship! “Cruising the countryside” – I love it! What a terrific photo this is! The Ibis seems to be staring back at us, and I like that you have the strip of green at the bottom for context. I’ve discovered that birds are more aware of us than I used to think. Sometimes, it seems as though they’re simply curious, and not judging the threat we pose. I like the strip of green, too. It’s a hint of a bird’s reality. They’re creatures of the air, but not only of the air. Being grounded is important! Beautiful capture (and I love the verse that accompanies the image). Thanks, Vicki. I suspect you get that feeling from time to time, too – especially after reading your latest post. Patience, indeed! The day for getting out and about will come! I really enjoyed both the photo and the poem. I just spent a few hours trying to capture images of white pelicans in flight, and am left wondering, how on earth do you do it? I couldn’t even find them on my screen, which was heartbreaking because they were flying very close to me and would have made for stunning images if only I could have pulled it off. Next time maybe I’d do better with my sketchpad and a pencil! I’m still awkward with this iPad, too. See my real comment below…. For every decent photo of birds in flight, I have a lot of truly terrible photos: one wing missing, blurry bodies, and so on. If a bird suddenly appears, it’s really hard, particulary since I often have the wrong lens in place. Setting the camera for continuous shooting helps. I’m wondering if you have an optical viewfinder, or if you have a camera with an LCD screen. I can’t even imagine trying to use of those screens with birds, although I’m sure there are tricks that the pros use that make it possible — as well as a lot of practice. When I started trying to photograph birds, if they weren’t standing still, I got a lot of photos of blue sky! I’m glad you enjoyed this ibis — they’re one of my favorite birds. There is a wonderful fecklessness in children, an innate restlessness. What’s over there? What is that? It’s criminal the way we fence ourselves into little yards of coulds, shoulds, oughtn’t’s, don’t’s, can’t’s as the world gets hold of us. We build our fences one stake at a time, but it doesn’t take long before the gate slams shut. We map out our days and account for every minute. We load ourselves up with things we’re told we need to have, and tasks we’re told we need to be doing with our time. We load our hearts and minds up with things we’re told we need to be thinking about and feeling And the thing that’s the most criminal about it is that we do it to ourselves. We have so many walls and boundaries and borders, mental as well as physical, around us that we have lost the ability to just get up and go see what’s over there. There’s an old litany that every parent knows: Where are you going? Out. We need to remember when we were the ones who said “Out.” We need to remember when a day when you had nothing to do was like being handed your favorite dessert. When it didn’t matter what you accomplished as long as you had a good time. You can pay top dollar to buy “pre worn jeans” or you can buy a new cheap pair at Walmart, and go places and wear them out yourself doing fun things, getting dirty, and stained, and ripping bits having a good time just seeing what’s out there. P.S., don’t appologize to ESVM. She was too busy being ESVM and wouldn’t have noticed anyway. You are in a hard place right now. A good little bit of the internal structure of your world has fractured and there’s broken glass all over the floor. It’s that dodgy place where you’ve got to stop, get your breath, let things settle a bit, and then start to sort through the debris to see what’s broken, what can be fixed, what can’t. It’s such a pervasive fracture that it seems overwhelming. If you need to step away from it, do it. Take a walk, get a breather. You can do this. Well, I just did it again. My “real” comment is below. I can’t get used to this iPad. I was going to say I’m not sure who ESVM might be, and that I didn’t remember apologizing to anyone recently, but I figured it out. That kind of “apology” is more literary convention than real apology. In any event, my world’s holding together just fine. I certainly don’t feel as though anything has fractured, or that there’s debris lying around. Truth is, I have certain kinds of freedom now that I haven’t had in years, and that’s all to the good. I just read your comment about the jeans to a friend I’m visiting this weekend. Coincidentally, we were talking this afternoon about kids, school, fashion, and the pre-worn, ripped jeans that still seem to be au courant up here in the hill country. We’re with you — wearing out our own jeans it far preferable to off-the-rack gems from the store.